Phoenicia Royal Hotel 5 stars is part of the Phoenicia Complex among Holiday Resort and Luxury. Opened in 2017, Phoenicia Royal is the latest and the most luxurious hotel ot he resort, being clasdified at 5stars. Buil on the sea shore at 100 meters from the beach, Phoenicia Royal Hotel consists of 144 double rooms and suites which provides sea and lake view. |All the guests will enjoy free of charge of all the Phoenicia Holiday Resort's Facilities. Meals will be served in the new restaurant where only the guests of Phoenicia Luxury and Royal will have access. Deluxe Suite - 60 sqm - Capacity: 2 adults + 2 childs 0-11.99 years old. Facilities - double bed (matrimonial), baby room furnished with bed, balcony, panic button in bathroom, balcony, air conditioning, internet wi-fi, LCD TV, bio cosmetics in bathroom, telephone, hair dryer, dressing gown, slippers , mini bar, turn down service, safe, iron, ironing board, electric kettle, coffee maker / espresso maker, magnetic card access, makeup mirror, daily housekeeping. Junior Suite - 42 sqm - Capacity: 2 adults + 2 childs 0-11.99 years old. Facilities - double bed (matrimonial), fixed sofa - the two are separated by an electric controlled blind, balcony, panic button in bathroom, air conditioning, internet wi-fi, LCD TV, bio cosmetics in bathroom, telephone, dryer hair dryer, bathrobe, slippers, mini bar, turn down service, safe, iron, ironing board, electric kettle, coffee maker / espresso machine, magnetic card access, makeup mirror, daily housekeeping. Sunset Apartaments - 61 sqm - Capacity: 2 adults. It overlooks the lake. Facilities - open space living room and bedroom, double bed (matrimonial), fixed sofa, bathroom with jacuzzi, kitchenette on balcony, spacious terrace, panic button in bathroom, air conditioning, wi-fi internet, LCD TV, bio cosmetics in bathroom , telephone, hair dryer, dressing gown, slippers, mini bar, turn down service, safe, iron, ironing board, electric kettle, coffee maker / espresso maker, magnetic mirror, makeup mirror, daily housekeeping . 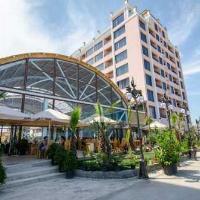 Sunrise Apartaments - 61 sqm - Capacity: 2 adults. It overlooks the sea. Features - living room and bedroom, separated by a glass partition, double bed (matrimonial), fixed sofa, jacuzzi in the bedroom, spacious terrace, panic in the bathroom, air conditioning, wi-fi internet, LCD TV, in the bathroom, telephone, hair dryer, dressing gown, slippers, mini bar, turn down service, safe, iron, ironing board, electric kettle, coffee maker / espresso maker, daily housekeeping. Presidential Suites - 64 sqm - Capacity: 2 adults. Located in front of the elevator. Facilities - open space bedroom with glass shower, room view, round bed, bathroom with jacuzzi, spacious terrace, panic button in bathroom, air conditioning, wi-fi internet, LCD TV, bio cosmetics in bathroom, telephone , hair dryer, dressing gown, slippers, mini bar, turn down service, safe, iron, ironing board, electric kettle, coffee maker / espresso machine, magnetic card access, makeup mirror, daily housekeeping. Combo Suite - Duplex - Surface: Varies between 84 sqm and 125 sqm, Capacity: 2 adults. Located on the 8th and 9th floors, with the interior staircase; On the 9th floor there is a terrace with sunbeds. Facilities: panic button in bathroom, air conditioning, wi-fi internet, LCD TV, bio cosmetics in bathroom, telephone, hair dryer, dressing gown, slippers, mini bar, turn down service, safe, iron ironing board, electric kettle, coffee maker / espresso machine, magnetic card access, makeup mirror mirror, daily housekeeping. Free services: wireless internet, parking, safe, beach, baby cot. For a charge services: room service, photo center (for the most beautiful holiday memories), airport / hotel / airport transfer, room service, beauty salon, pharmacy, minibar, grocery store, water sports, helicopter trips. The rates are available for 5 and 7 nights stay and include accommodation for 2 persons, private beach access with sunbeds, swimming pool access, parking lot (subject to availability), playground access for children, wifi internet connection, fitness room, aerobics, saunas, sports center, and meal services as presented in the table above. The rates are available per night and include accommodation for 2 persons, private beach access with sunbeds, swimming pool access, parking lot (subject to availability), playground access for children, wifi internet connection, fitness room, aerobics, saunas, sports center, and meal services as presented in the table above. - 0-1.99 years old will bennefit of free accommodation and meals. -ALL (all inclusive) - mic dejun + pranz + cina (bufet suedez), bauturi alcoolice si nonalcoolice in timpul meselor si pe toata durata zile la barul de la plaja si piscina. 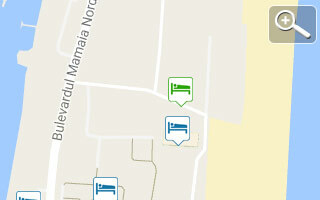 Accomodation offer at Phoenicia Royal Hotel Mamaia Nord is published by Litoralul Romanesc.ro Tour Operator Agency.